This post is sponsored by Birch Lane. 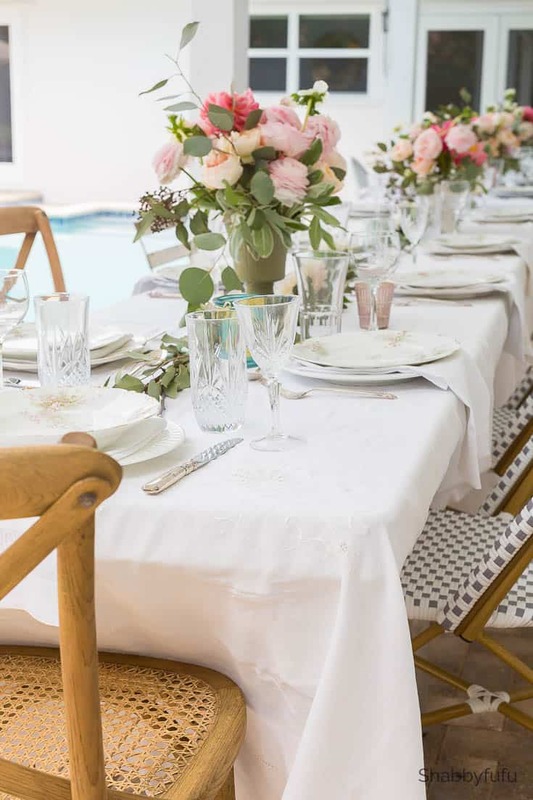 A beautiful affordable wedding reception at home is definitely doable for all! We are coming off the high of tossing together a celebration this past weekend for our daughter. Although our girlie and her guy had been engaged for a couple of years they sprung the wedding plans on us just a few weeks ago! Yikes…I think that everyone who knows me figured that I could pull it off. As a consummate planner down to to the last detail of pretty much everything, I was up for the challenge! My lovely daughter had a few wishes and one of the smartest things that she did was to set up a Google spreadsheet for the family and assign each of us tasks. She decided to invite her closest friends and relatives and with such short notice there was a manageable amount of peeps for our outdoor affair. Her theme was centered around three of her favorite styles and that got the wheels turning. 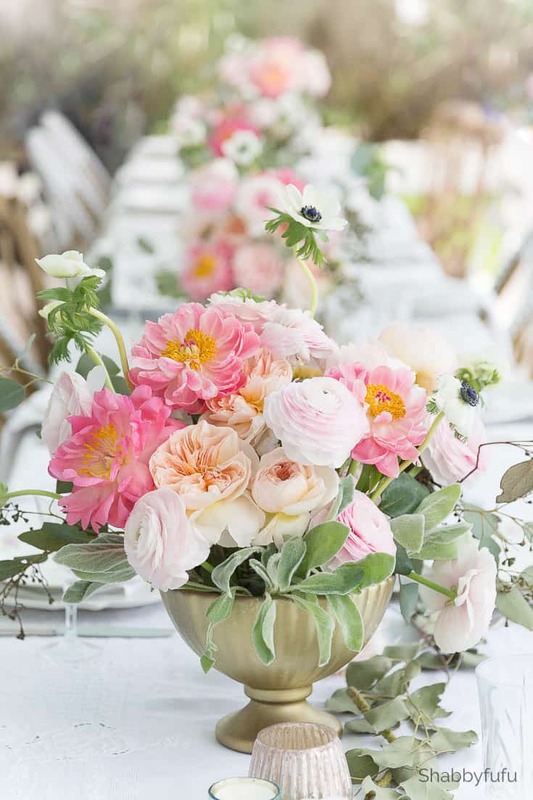 Boho, romantic and French…which if you follow along with me you may have noticed I too love! Flowers make a room whether indoors or outside and I ordered several favorites from my local wholesaler. We had David Austin roses, Cloony Hanoi ranunculus, coral peonies, anemones, lambs ear and eucalyptus. 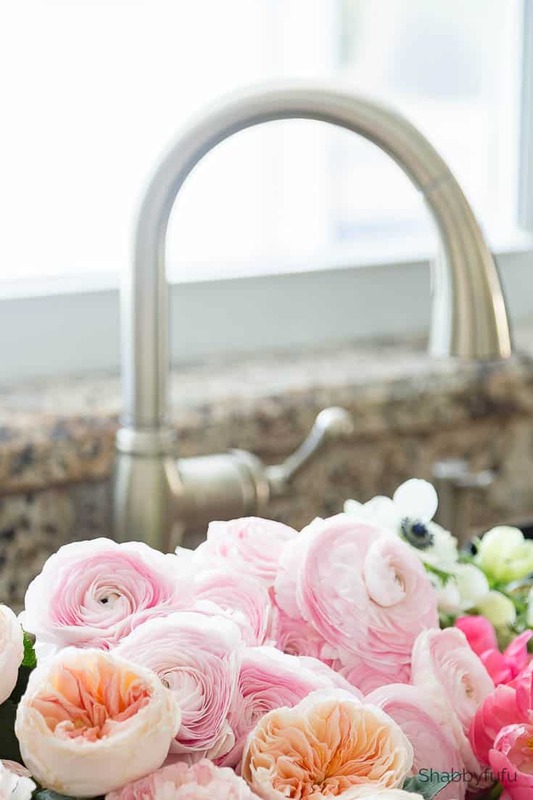 Yes…typical “flowers in the sink” photo, but these flowers are far from typical. You could definitely do a more budget arrangement with flowers from the grocery store and mix in faux flowers and greenery! 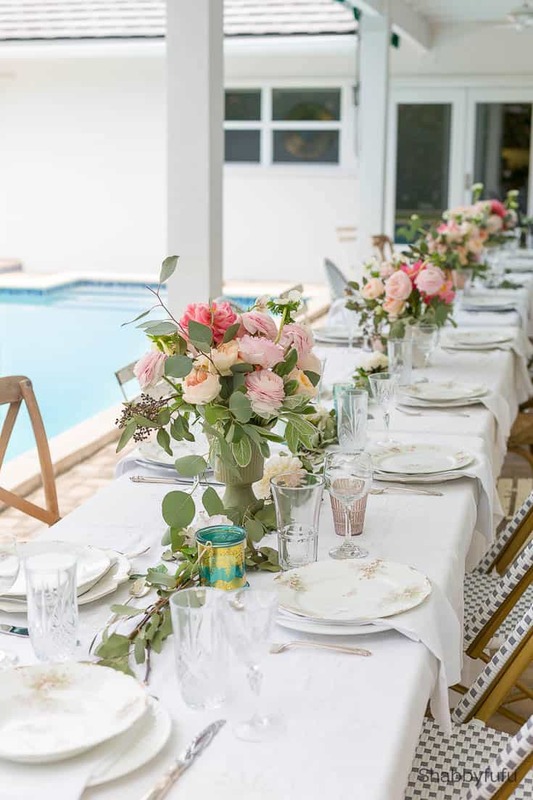 This party setting looks elegant and did take planning, elbow grease and thought…but you can do this too. It’s economical compared to having a catering hall type of event. More fun in my opinion too! 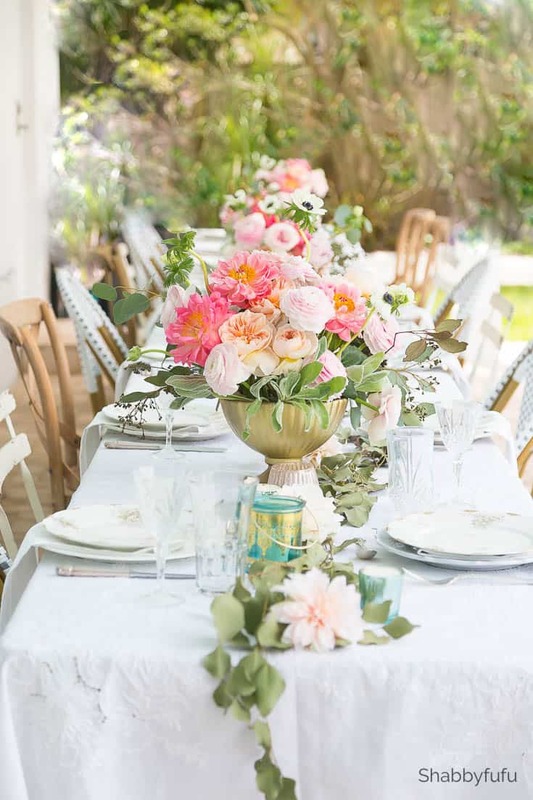 Tips for a beautiful affordable wedding reception. 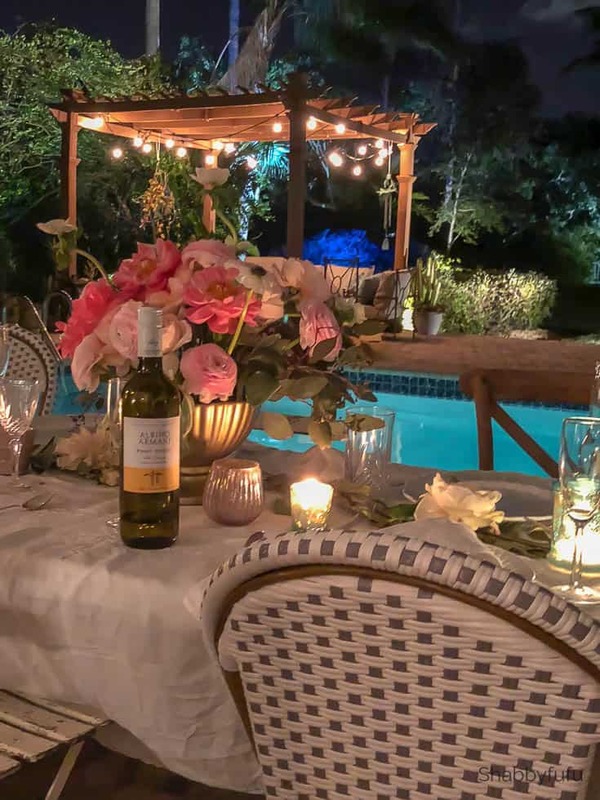 Location – I realize that not everyone can do a wedding reception at home. My husband and I got married at the beach, and outdoor weddings are amazing! Be sure that you have a plan B (or tent). Paperless Post – You can save on invitations and just sent out the event as many millenials do via the Paperless Post website. Flowers – mine were from a floral wholesaler, and if you don’t run a business you can still buy wholesale on-line or use faux flowers. As I mentioned, grocery store flowers will do if you foof them up. 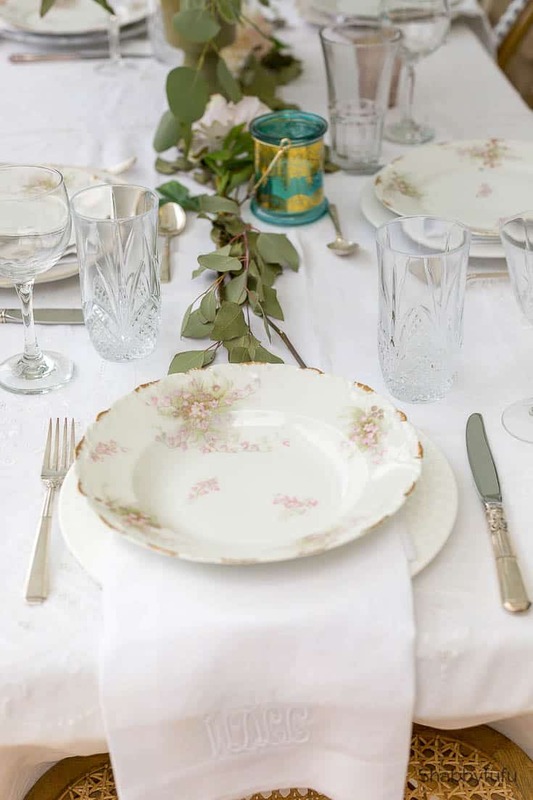 Tableware – most of the items on our tables were vintage that I’ve collected for a long time. If you don’t have a lot of vintage items you should hit up the thrift shops and scouring for linens, plates, glassware and flatware. More about THRIFT SHOPPING here. Food – I didn’t want to do the cooking so we ordered food from a local restaurant that is known for catering. We set up the food buffet style and I purchased a reusable party warming kit. Find that HERE. Stocking The Bar – Stocking the bar with mostly wine and beer helps hold down the cost. If relatives offer to help, have them bring a case of champagne or wine! Mix and Match For An Eclectic Theme! Not everything needs to match, therefore it adds interest when you mix up the table setting decor! I borrowed some folding banquet tables from a friend and purchased others. You can push tables together to form long and lush looking dinner tables. When covered in linen tablecloths, who’s to know! The chairs are a mix and all have that French feel that we love. Thank you to my friends at Birch Lane for sending me the stunning affordable grey and white check French style LUCIA PATIO STACKING CHAIRS that arrived just in time! It was so much fun setting up for this beautiful affordable wedding reception! We served the food buffet style from the kitchen island because it’s hot outside in Miami. Everyone grabbed a plate and headed in and helped themselves. The beautiful affordable wedding reception continued outside. We knew that this party would last well into the night and planned our outdoor lighting to keep things bright. We purchased commercial string lights that you can find HERE and a dimmer (so glad we did this!) that you’ll find HERE. I hope that you enjoyed this and please let me know if you have any questions or comments! I’m splitting this event up and will post some more photos and ideas soon! Pin this post below for future reference! You did a great job! Such a pretty setting. I’ve done a lot of functions, and I’m sure you had sore feet that night! Congratulations Janet!! What a beautiful wedding you’ve thrown for your baby. The flowers are to die for, and you’ve given us all such great tips. I don’t think I could pull it off but you’ve given me hope that it can be done. Thanks Patti! Having my organized daughter definitely helped me with the planning and it matched our vision pretty nicely! Simply gorgeous!! As a Mom who had a daughter get married four years ago, I so wish I had been able to talk my girl into a simple affair! The amount of money you spend for things, when simple looks so elegant! I wanted a babies breath and lace theme, but of course, her wedding!!! Anyway, your special day looks absolutely magical!! I love it all!! Thanks Teri! My daughter has been to lots of weddings by now and knew what she wanted. I was more than happy to oblige and it was so well received! Congratulations to your daughter! It looks stunning both by daylight and candlelight! I’m sure the reception will be remembered by family and friends for a long time! Some how having it at home makes it extra special! And it looked lovely! Congrats to you too for putting it together in such a short period of time! BEAUTIFUL !! —. the flowers, the setting, the evening lighting and ambiance look spectacular !! So exciting. AND thank you for sharing. Thank you so much Linda…it turned out just how I envisioned and I’m so pleased that our guests had a great time! BEAUTIFUL…..I KNOW you could do this memorable wedding. What an organized young woman your daughter is doing a spreadsheet of tasks huh I wonder who she got that from? ha ha Looking forward to more lovely pics! Haha! !….she is pretty amazing and definitely worth doing this for our girlie! Congratulations Janet, I was thinking of you on Friday getting ready. You did an amazing job with family pitching in as needed. 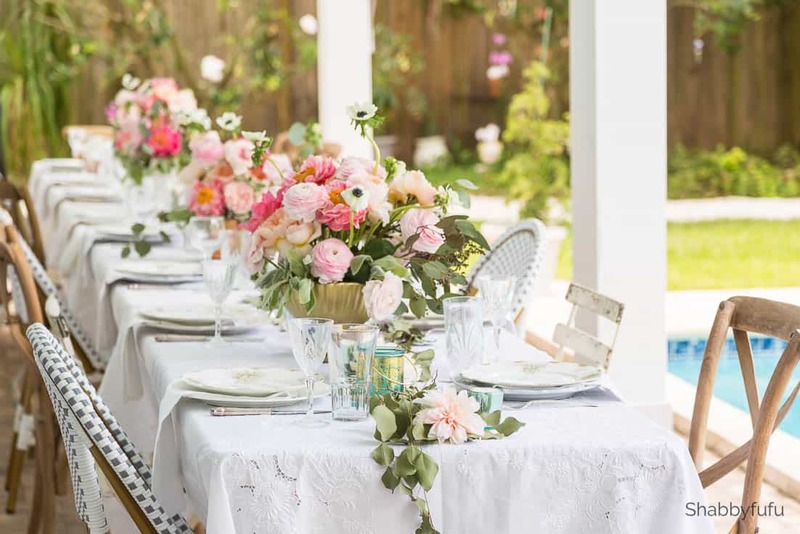 The flowers are amazing and so are the chairs from Birch Lane. Can’t wait to see more. You knew you could do it as well as I did. 😉 Oh my goodness, the table was gorgeous. The flowers!! I swear I lingered over the first pic of them, they were that beautiful. And I absolutely love the the gray and white check chairs. A perfect combination. I can’t wait to see the other pictures. I want to say congratulations on a job well done! Stunning! I love it all and I know your daughter did too! Thanks Debbie…we all had a blast and I’m still in cleaning mode here since they left last night! Beyond beautiful!!! I have two daughters. One will want the entire she-bang, while the oldest is thinking about a beach wedding. Stupid question…do you have bugs in Miami….as in bees/mosquitos??? If so, did you spray your yard beforehand? Not a stupid question at all! We do have mosquitos in Miami, but it’s not quite the season yet. The rains start in May and then they all come around. The bees are only out during the morning and on the flowers that are further out in our garden. Careful planning! What an exquisite and personal wedding reception! I love every detail! The flowers are Ahhhhh-mazing!! I knew it would be incredible and it was! What a beautiful lifelong memory you created for your daughter! Congrats to all!! Thank you so much Carol….we had such a great time and lots of memories for family and friends! Everything is perfect Janet. If you weren’t so successful at your day job you could do weddings instead. I bet your daughter must have been thrilled with the result. Thanks Mary…and NO THANKS too, LOL!!! Just gorgeous, Janet! I love all these details and can’t believe you pulled this off so quickly, well…actually I can believe it because you are amazing! Congratulations Janet, it all looks beautiful. I know that it’s a lot of work but some of my very best memories are planning big parties and at some point during the event taking a moment to soak in all the joy. Just gorgeous Janet! Having hosted four weddings at our home I know how much work is involved! Your daughter is lucky to have a talented Mommy! You are much braver than I am Cindy! One more daughter to go and I need to recuperate for awhile, lol. Thanks Sarah…I really had so much fun doing this and since I’m a collector had all of the necessary stuff! What a beautiful wedding reception! You daughter is lucky girl! I think its a great idea to do it home. My daughter married at the St Regis in Miami and it was a small fortune. If we could do it over I would do this! Thanks Maria! We did what she wanted and it was so special because this is the house that she grew up in. Weddings can cost so much! It’s absolutely gorgeous, Janet!! The flowers are exquisite and the china and table decor perfect! What a lovely way to celebrate such a happy occasion!! Thanks Lory…we will all remember this one fondly and it didn’t cost an arm and a leg, lol! Gorgeous, elegant but simple!! I’m sure this setting helped form enduring memories for your family! Congratulations by the way! But your tips are also great for any kind of outdoor event. The flowers… OMG! Thanks Nancy…we truly enjoyed it and so did our guests! It all looks unbelievably beautiful! Lovely vintage french accents. Just love the new bistro chairs Janet! Do I see an additional career in your future! !…the wedding reception is exquisite!! !…Lucky daughter to have such a talented and oh so caring mother as you!…Congrats to the bride and groom…and you have made their very special day even more special with the gorgeous venue…truly a labor of love! …. ugh, I wish this wholesale was close to me!…the closest one is 2 1/2 hours away in Charlotte. Incredible! 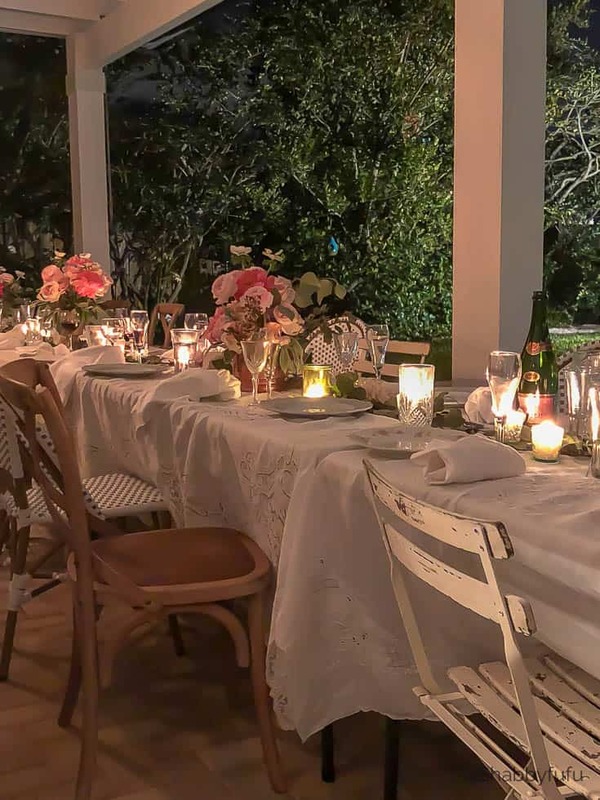 Fantastic tips that can be used for any outdoor soiree! Love the flowers, China, lights, everything! You certainly have a backyard paradise! Hugs!